TL-HV is designed for Electrospinning of both lab & industial use. 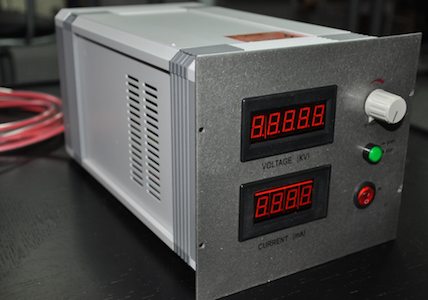 The DC/DC TL high voltage power supply has an adjustable output voltage in large range with built-in over-current protection and short-circuit protection. Input is AC100~240V and output voltage can be adjusted. There are various models available, 0~30000V, 0~40000V, 0~50000V, 0~60000 and 0~80000V. Electrospinning is advanced technology to mkae nanofibers. Nanofibers are an exciting new class of material used for many value added applications such as medical, filtration, barrier, wipes, personal care, composite, garments, insulation, and energy storage. Special properties of nanofibers make them suitable for a wide range of applications from medical to consumer products and industrial to high-tech applications for aerospace, capacitors, transistors, drug delivery systems, battery separators, energy storage, fuel cells, and information technology. Protection against output short-circuit and arc discharge.